By combining (or “mashing”) data from The Collected Works of Abraham Lincoln, the Papers of Abraham Lincoln at the Library of Congress and the Lincoln Log (or Day-by-Day) with a map from Google and timeline from SIMILE, we can present an integrated view of Lincoln’s political world. This way to visualize data essentially allows researchers something akin to one-stop shopping. 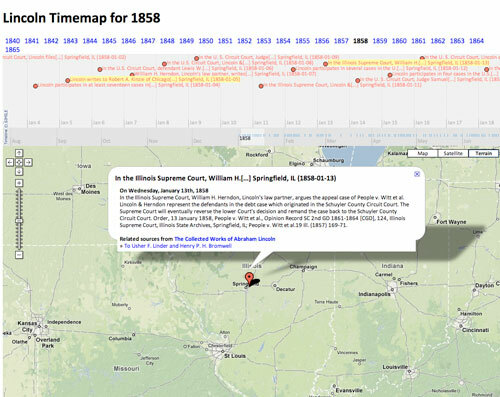 Click on the timemap link below and experiment with the timeline bar at the top of the frame to simultaneously view links to Lincoln’s incoming and outgoing correspondence within the context of his daily activities and geographic location. This technology probably represents the future of Internet research and one of the benefits of a digital world, allowing data from different sources to be visualized together. Building the Digital Lincoln, Journal of American History, (Digital History Project, September 2009). © Copyright Organization of American Historians. All rights reserved.